This picture will forever make me laugh. It was taken two years ago, on a crazy-long (over 24 hours) trip back to the US. It was our yearly winter visit, and for some reason everything on this trip went wrong: flat tires, delayed flights, missed flights, you name it. But what’s so funny about this picture (besides my sad/disgusted/hilarious expression) is that my then-20-month-old daughter is sleeping soundly under the airport chairs. Yep. Her sweet, healthy, clean little body is laying on the floor under the nasty, dirty, I-don’t-even-want-to-know-what’s-under-there, airport waiting chairs. I remember resorting to this after she had been awake for some ridiculous number of hours, and this was the only way we could make a dark enough environment for her to fall asleep. 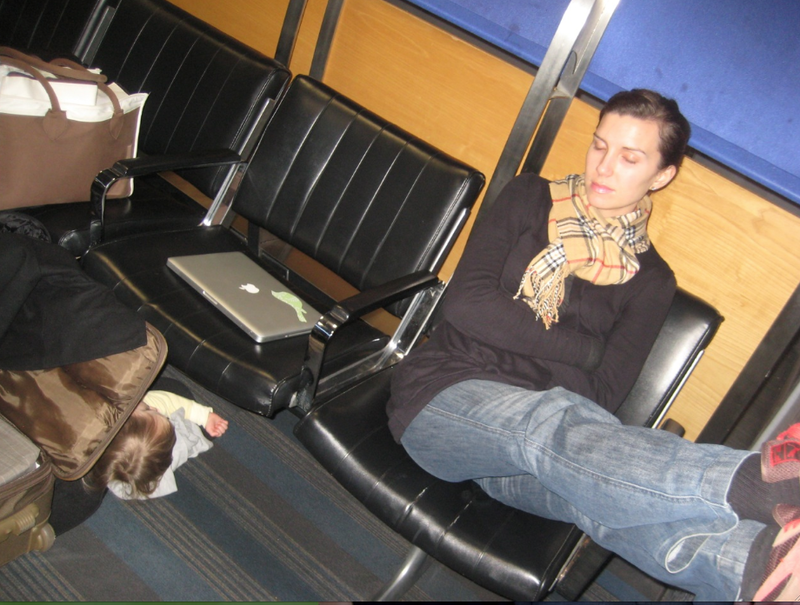 I laugh because this picture captures what travel seems to do to our family. For some reason, time stops, reality stops, and a strange survival mentality of ‘anything goes’ starts to emerge. By around hour eighteen I find myself saying things like, “sure honey, go ahead and eat the raisin that dropped on the airplane floor, that’s fine” or “just let her sleep on the floor” or “I say we buy one of those oversized M&Ms bags for $20 and eat it in one sitting.” Gross, right? I’m actually a very clean and organized mom, but for some reason when the stresses of travel start to wear on me, I seem to slip into a strange ‘anything goes’ mode. Have you ever felt like this? A season where time just stops and it seems your idea of ‘normal’ life is on hold? I remember reading an article on the pressures of a being a ‘caregiver’ to someone, either as a family member or as a career. What struck me about the article was that the best caregivers were the ones who don’t put their own lives on hold in order to care for the life of the other. It’s one thing (and such a incredible sacrifice) to give up everything for a sick family member and become their carer every waking moment. But I suppose it’s another thing (and incredibly hard) to care for someone constantly, while at the same time trying to maintain a healthy sense of one’s own life as well. I think I face the second kind of struggle with parenting. And similarly, I’m convinced that I’m a better mother to my daughter when I set aside time to take care of myself, or to be involved in areas of interest outside our family circle –basically, when I don’t wear my ‘mom hat’ 24 hours a day, seven days a week. I feel like we’ve touched on this topic on TGW a few times, but as the new term is kicking off and we have some new readers, I just want to encourage you not to let time stop while your spouse or partner is in graduate school. It’s a strange, isolating, and sometimes confusing time, but don’t give up your entire life in supporting your partner in his or hers. If you’ve made career sacrifices by moving to a new place, start work as soon as you are able, or volunteer or take some classes on a new or old hobby. Over and again, people have shared with me that a part of their dreams died when they signed on to be a supporter through grad school for their significant other. Don’t do it! Let the dreams take new shapes and avenues, but don’t let them die, and don’t put them on hold too long. Here’s the thing: I’m cool with not knowing where we might end up in two years when the PhD is over. I’m cool with an academic wife’s life, or even the chance of not being an academic’s wife if my husband’s career path turns. But what I’m not cool with is a life in academia (or any other job for that matter) that sticks my husband in front of a computer screen allllllll day long doing research. Sigh…I know there’s not a way around that these days, but after our first year of PhD research, I realized that something needed to change. I was not cool with him coming home exhausted from straining and staring, and totally spent due to the mental stress of being on a computer 24-7. Don’t get me wrong – I love working on the computer. I’m even a graphic designer on the side; there is, however, no denying that there is a profound difference between holding a knitting needle, a wooden spoon, a paint brush, a screwdriver, a garden hoe, and a musical instrument, on the one hand, and putting one’s fingers to a keyboard, on the other. Both can produce amazing results, but only one can give you something to touch, to eat, and to rip up. There’s a sense in which engaging with the tools of craftsmanship forces the artist into a relationship with creation. Conversely, could it be the case that typing on a computer all day fosters isolation from the world? From what we have experienced, working on the ever-evolving and translucent (almost imaginary) world of PhD research can certainly leave you feeling disconnected from the tangible, material world around you. It can often leave you exhausted and frustrated because of the hard work necessary to produce something invisible, something that can never be held in your hands (until it is printed on paper). Over the past few years of grad school we’ve noticed this tension, and as you can tell from my rant above, we desperately needed to do something about it. We started asking, ‘how can we make this PhD process more humane, more liveable, more energizing? Put more simply, how do we avoid letting my husband become drained from his research? We started with a ‘makeshift’ workshop. My husband has always liked bikes and taking care of them, so we’ve collected quite a few used bikes in our tiny garage. They are great for when friend’s come to town or if a friend here needs an extra to borrow. He spends time fixing these bikes up and then selling them off again, and he even offers to help fix friends’ bikes as well. It’s not a weekly thing or even a monthly thing (although I know he wishes it was), but it’s a start. The tools and set-up are there. It’s a chance to connect to something tangible, to feel a sense of accomplishment by seeing a task come to completion. Cooking is another area in which we have tried to foster this idea. Anyone who has known me longer than seven months would probably share that I was a pretty average cook. And I must confess (to my sister-in-law’s dismay) I used to buy fajita/chilli/taco/cous cous pre-made spice mix packs. I was that kind of cook, even though there is nothing inherently wrong with the method. I just wasn’t an adventurer in the kitchen. Due to some health issues I’ve touched on before, we decided to go gluten-free and dairy-free. It’s become absolutely therapeutic to dive into the joys of cooking. Maybe my friend Laura will share a bit more on that one day, but for now, let me just say that cooking is powerful and healthy for one’s soul. It’s real, gritty, messy, savory, satisfying and incredibly intimate when shared. My husband and I definitely don’t cook together every night, but when we do (or when we make dessert, which is more often the thing we create together) it’s cathartic and stress-releasing and freeing. And it’s so rewarding to see and enjoy the result of your hard labor -only a few minutes later. And music: an art of creating something beautiful from nothing. We cherish taking time to close out the virtual world and listen to the stillness and the rhythms around us, to create order and harmony. I make us sound like aspiring composers. Very far from it, but the small act of buying a keyboard for our living room has been incredible (I know design friends would find it an eyesore, but I am working on a cute skirt for it). Digital, I know. I wish we had room for a real piano. Regardless, it is inspiring and cathartic to sit down and conjure up tunes. I’ve watched my husband unwind as he starts playing something for my daughter, and it has provided us with hours of helpful stress release. I share this in the hopes of helping someone out there with the almost anchorless reality that the PhD can sometimes bring. We’ve found ways to find fulfillment and satisfaction, and a bit of stability, in a few of the ideas shared above. We’ve found that making time to engage the material world brings us back to reality and takes the microscope off ourselves and our research. So, if you find yourself in a place like we were, and you need a balance of hands-on, real world craftsmanship to pair with your mental exercise, perhaps finding your inner artist through a tactile hobby is your answer. The below question and responses were compiled by fellow graduate wife reader, Laura Lee. She surveyed several women on the journey and is sharing with us their answers. You can see her original post here, where she outlines her journey towards discovering the answers of a ‘balanced’ life during this season of being a graduate wife and beyond. This is part V of the ‘What does a balanced life look like?’ series. Enjoy! 4) Part of a balanced life involves keeping your house in order. How do you do it? Do you keep a chore chart? A cleaning schedule? How do you maintain things from week to week and month to month? How do you take care of the very basic things like who washes up the dinner dishes each night? Chore chart – When we were first married, the BEST advice we received on this was: find a chore that you and your spouse hate and switch! I hate to vaccuum, so my husband does that; he hates to grocery shop, so I do that. It has worked out well. We don’t have a set time in our house of when the vaccuuming will take place – as he knows it’s his job (although I do it on occasion) – and I refuse to nag him about it, as he is an adult. Usually, he’s pretty good about helping around the house. I do try to follow a cleaning schedule (bathrooms on Friday, kitchen floor on Monday, laundry on Tue/Wed, etc) – so my cleaning is staggered and I have more time to spend with the family on weeknights. We (my son and I) normally don’t arrive home until 6pm on the days that I work. I immediately feed him dinner (which requires planning ahead, as he usually doesn’t eat with us). While he’s eating, I start our dinner, pack lunches for the following day, and then start washing our dishes. I try to do it as I go along, as it cuts down on cleaning time after dinner. My husband is home by 615, and my son normally finishes dinner by 645. My husband plays with him for a bit, then gives him a bath – this allows me to finish dinner. We put our son down for bed at 8, and eat dinner then. I clean continually rather than all at once. When I worked, I would blitz the cleaning on Saturday. Now, I do it when I have a second (i.e. daughter is in her highchair eating lunch, so I take the few moments to clean around her – do the dishes, wipe the counters, etc.). Bathrooms get done when she naps or goes to bed. I clean her room and our room while she plays on the bed with toys (granted, I have a baby who doesn’t crawl or walk and plays in one place!). I don’t keep a cleaning chart. I would imagine this will come in handy as our family expands, though! As for dinner dishes, my husband does those at the moment because our daughter still nurses once before bed. There are days when it’s really hard to get the cleaning done (or be motivated to get the cleaning done), though, so I look forward to hearing other thoughts. I have a chore chart in my head and in my calendar but if something comes up I just move it to another day. I do two loads of laundry (whites and darks) on Monday, two on Tuesday (colors and grays), and a load of towels on Thursday. Wow!…How do we have so much laundry with just three of us?!! Is this normal?? I clean the floors and vacuum on Wednesday when my son is napping. Sometimes I vacuum when he is awake because he likes it. I clean the bathrooms and vacuum on one weekend day, usually when my husband is watching our son. I am constantly doing dishes and dream of having a dishwasher someday! When I’m cooking I try to do the dishes as I go. I also clean daily so when it comes time to do deep cleaning it’s not so horrible. Oh my goodness, haha my husband would LOVE it if I had a chore chart (he loves charts and to-do lists!)! But it’s just not me. I keep the visible things tidy and I like the house to smell nice, but beyond that, my main motivation to clean is when we’re going to have guests! :) My husband is very organized and neat, so I try to have things tidy (with the kids help) when he comes home from work. It helps him to relax and is like a love letter from me (his love language is acts of service). This has been a big learning curve for me over the last 13 years and has been one of our big ‘issues’….how to balance my laid back attitude with his need/wish for things to be in order. It’s a work in progress on both our parts! The below question and responses were compiled by fellow graduate wife reader, Laura Lee. She surveyed several women on the journey and is sharing with us their answers. You can see her original post here, where she outlines her journey towards discovering the answers of a ‘balanced’ life during this season of being a graduate wife and beyond. This is part IV of the ‘What does a balanced life look like?’ series. Enjoy! 3) How do you plan your meals and shop weekly for your family? How do you make healthy choices? Do you have favorite recipes books that help, a good website, a super easy vegetable prep method? Any ideas on meal planning you’d like to share? Meals – I reserve one hour on Sunday nights to do meal planning for the week. This usually gives me enough time to peruse our family diary, determine how many meals I need to cook for the week, do my meal planning – looking for recipes,etc – and then ordering my groceries online. Since I’m not home 4 days of the week, it helps to plan ahead I just invested in a cookbook called “Less Meat, More Veg” I’ve been cooking out of it, and have found it has lowered our grocery bill a bit (I tend to buy mostly organic items). I also try to chop veggies up when I get them, and then put them in the freezer (if I’m not going to use them that week), as I find it cuts down on prep time as I’m trying to cook. I plan for a week’s worth of meals, and we use Tesco.com with great admiration and joy. And I LOVE the Martha Stewart recipe finder at the moment and am rarely disappointed with the outcome of cooking one of her meals. She has an ‘everyday food’ series, and they are simple and healthy meals. I have organized my favorite recipes under my ‘bookmarks’, so I will often scroll through those when planning for the week and pull out faithfuls (Butternut Squash Baked Risotto and Moroccan Chicken Stew are two really good ones – just noticed they’re pretty wintry, but oh well). I also feel I should share this little gem, a no-knead bread, tweaked by a friend from St. Andrews but originating from Mark Bittman. It is shamefully easy, and we have it for breakfast, lunch and dinner lately. All this being said, frozen pizza, Peppers Burgers and The Mission happen in this household! I plan meals a week in advance. I usually plan it out and do online shopping on the weekend. I also get an organic fruit box delivery from Able & Cole once every two weeks. I don’t like to order much produce online because I’ve been disappointed with the quality, so I found that this fruit box lasts us almost two weeks. I’ll go to Tesco, Co-Op, or M & S for other things I need throughout the week…usually produce. I’ve found out which stores have the cheapest prices for things we like to eat and then I hop around to all the stores. I’m probably crazy, but It’s saving us a bit of money. Some of our usual meals are greek chicken salad, baked ziti, chicken and veggie casserole, chicken/bean burritos, salmon and veggies, and “jazzed-up” frozen pizza(I usually get a frozen margarita pizza and we put chicken, mushrooms, olives, etc. on it…it’s cheap and yummy!) The baked ziti and chicken/veg casserole are great as left overs! I also like to do the frozen pizza on Fridays when I’m usually burned out from cooking. We plan a week of meals at a time usually on Sat or Sun. We don’t always assign each meal to a particular day at the start of the week because then I can wake up on Monday and I still have options. (Is it a fish and rice day or a lasagna day?) Usually we plan about 5 meals (assuming 2 of them are bigger meals and will provide another day’s worth of leftovers.) We try to mix in some easy/quick ones and some more involved ones depending on the look of the week’s schedule. We look at the weather forecast (warmer days mean lighter dishes, cold rainy days means more roasts or soups.) We always have at least one vegetarian meal (usually 2 or 3) as we have committed ourselves to ‘Meatless Mondays’. I make sure there are meals that my husband is happy to make on his own for those days when he takes on dinner. I try to throw in a brand new recipe every few weeks to keep us trying new things too. And we try to mix up what type of protein we are eating each night (meaning we try not to eat chicken 5 nights a week. Then I make a list and do the weekly shop at the local grocery shops to buy whatever ingredients we’ll need as well as stuff for packing lunches for my husband and breakfast stuff too. I do a big online order once every 4-5 weeks to stock up on non-perishable and heavier items like juice, canned beans, pasta, canned tomatoes, toilet paper, etc.As for healthy choices my rule of thumb is… if you don’t think you should be eating it (or not very often) then don’t bring it in your house (or not very often). It’s ALWAYS easier/faster to throw in a frozen pizza or snack on a cookie. But, if there is no pizza in your freezer or cookies on your counter, you’re forced to find a healthier option – like making your own, much healthier pizza or eating some yogurt. One way we do this is by buying lots of fresh veg (carrots, bell peppers, snap peas, baby corn, celery, cucumber, etc). Ideally twice a week I’ll cut up a few carrots, cucumbers, peppers, etc. and throw them in a big tupperware. I’ll do this with thick slices of cheese too. Then, when we’re in a hurry or need to grab a quick snack for the stroller or are just feeling peckish at home, it’s super easy to grab some veg and cheese (and hummus?) rather than a cookie. Of course a handful of grapes or an apple or banana (which don’t need cut) works just as well – but not with the hummus… eww.I like to do the same thing with a big old bag of trail mix. Just mix lots of almonds, sultanas, dried apricots, pretzels, peanuts, cashews, chocolate chips, mini marshmallows etc. Quick to grab and pick at when you just want to munch on something salty or sweet. Good to send with husbands to sneak into libraries too! I shop online at Sainsbury’s and get a delivery once a week (on Wed). I also get an Abel and Cole box of fruit and veg that comes on Tues. I’ve loved being forced out of my comfort zone and learning to cook these really weird British root vegetables! I plan a weeks’ worth of meals and shop online in about 30 minutes! I don’t mess around. Get ‘r’ done! We buy lots of fresh spinach (2-3 big bags a week! ), bell peppers, cucumbers and organic carrots and just have them out at dinner. The boys eat a couple of handfuls of spinach and probably half a bell pepper every night at dinner. Very rarely do I cook a veg to go with dinner. I make a main dish and stick the fresh veggies out. And the kids just go for it….no need for Ranch dressing either (unheard of when I was a kid!)! They just love the taste of the veg. When the kids were little I would never have imagined this day would come! Miracles never cease! The below question and responses were compiled by fellow graduate wife reader, Laura Lee. She surveyed several women on the journey and is sharing with us their answers. You can see her original post here, where she outlines her journey towards discovering the answers of a ‘balanced’ life during this season of being a graduate wife and beyond. This is part III of the ‘What does a balanced life look like?’ series. Enjoy! 2) If developing and deepening your faith is important to you, how do you find time to do that with jobs, families, and supporting your grad student spouse? When do you take time and what do you do during that time? Devotional time – this one has suffered greatly since my son’s birth. I used to put enormous pressure on myself about spending time reading my Bible, praying, etc…to the point where I was getting no sleep trying to do it all, and feeling like a bad mother and horrible wife, and frankly, that was true. I spoke to a mentor of mine – who has 5 grown adult children – and she basically said, “God extends grace to mothers.” For whatever reason, that put a new spin on things for me, and I didn’t look at it as such a chore. So now, I look for pockets of time in the day to reflect and pray – I find my runs to be a good time for that – and I usually read my Bible at night before I go to bed. And, by serving my family, I am serving God. I’m finding that God is meeting me right where I am in this current season of life – he sends little nuggets of truth my way all the time. I also listen to sermons when I run as well. I am far better at making time to run than to spend time with the Lord (I am willing myself not to delete that comment). That being said, I have found that my most ‘centered’ times are when I am running, so I will often listen to readings or sermons while running. Here are two sites I frequent for sermons:Tim Keller’s free sermons and Lyle Dorsett’s sermons (an old prof). Also, I enjoy using a study or commentary to guide my reading, like Tom Wright’s ‘for everyone’ series. I’m a school girl at heart, so I love filling in blanks and completing lists. It’s always been easier for me to read during the evening sometime, even though I’ve always wished it was the morning. I try to spend time with the Lord throughout my day. I am the queen of “breath-prayers” which are just a sentence or two speaking to God. It has been a challenge for me to have a set “quiet time” with the Lord where I’m not praying and doing something else…but it looks like I’m not alone. I tend to pray in the shower and when I’m on walks with my son, or on the treadmill. I also like to listen to sermons from our church back home when my son is napping. My husband and I recently decided that we are going to spend an hour in the evenings, after our son goes to bed, reading the bible and praying together. We used to do it before our son was born and started it up again. I love the Psalms and Proverbs and enjoy reading those before I go to bed. I think I’ve mentioned this before but I am NOT a morning personal by nature. Morning is not the best, freshest time for me to give a chunk of my time and attention to God. So I often do this before bed (assuming I’m not passing out on my pillow exhausted from the day!) Occasionally, and this is my favorite way to do this, I make myself a cup of tea and spend my daughter’s nap time reading/in prayer. But mostly I just pray about 800 times a day… trying to include God in each small choice I make (and attitude I assume) all throughout each day. My husband and I always pray together before we drift off to sleep. I’m not big into ‘devotional’ style books but I do enjoy reading and there are lots of good books out there which challenge me to read the Bible in fresh, deeper ways and cause me to hear God’s voice in new ways too. Someone talked to me about ‘seasons’ when my first son was little bitty baby and I have to say that was the single best piece of knowledge I got about having kids and being on a graduate student schedule/lifestyle. Life comes at you in seasons and having little kids in your home is a season like none other! I can remember amazing times with the Lord sitting on my steps in our little flat in Cambridge while I was breastpumping in the middle of the night. BREASTPUMPING!!! As my friends in East Texas might say, ‘Who’da thunk it?’! Regarding seasons, I do have to say about a year ago, when my last one was 2’ish, I realized that I was out of the ‘baby season’ but that my time with the Lord hadn’t progressed past that season. So I kind of had to kick start myself since I realized I was beginning to have more time to invest in spiritual disciplines again. I’m a one book at a time kind of girl. I love to be absorbed in a good book and I read, read, read until I finish it. I find this is how I like to do my Bible study. Whatever we’re studying in church or my Monday Mums group, I like to just bury myself in it. So for example right now, I’m really looking forward to getting stuck into Isaiah as we go through the book in church. My husband is a biblical scholar so he will give me a good book to go along with whatever I happen to be into at the time and it helps me through the hard bits or historical stuff. Also, I’m not really a ‘doer’ but more of a ‘be-er’, so I find passages like John 15 where Jesus tells us to ‘abide in Him’ really encouraging. I just want to be connected to Jesus. I want to interact with him, complain to him, talk in my head to him and rest with/in him. But I also want to be stretched by him. I’ve been learning over the last couple of years to allow the Holy Spirit to use my spiritual gifts in ways that I know are not my own ideas. Often times I find it really easy to operate while using my natural gifts. I even find it energizes me. But I’ve been praying that God would use my gifts (hospitality, mercy and giving) in supernatural ways to benefit his people and his kingdom. Last year I felt urged to call a friend and tell her I was bringing them dinner one night. I knew she was pregnant (and due soon) but I had no idea all 3 of her children had had the stomach bug and that she hadn’t slept in 3 nights! That meal was like a love letter to her from God. Then there was a time I felt God lead me to buy one of my best friends back in the states some make-up. I obeyed (with trepidation wondering how I was going to explain to my husband why I spent $80 on make-up for my friend miles and miles away), but then was astounded that she (who’s hubby is doing a PhD and they are on an extremely tight budget) had been praying specifically that God would send her some new make-up! My husband couldn’t argue with that! In fact, he rejoiced with me that his hard-earned money was used by God to love on our friend. Sorry, that was kind of a tangent, but I’m very relational and to see my relationship with the Lord benefiting others is a real motivating factor for me.